The 2012 budget war commenced in earnest today as President Obama presented his spending proposal: Once again, clean, renewable energy and environmental sanity are at the heart of the package. The question is, will the GOP once again gut it like a fish and leave it for dead? One of the biggest battles of the past few years has been over tax breaks for big oil and big gas. These huge companies have been obscenely profitable over the past few years, but the GOP continues to cling to the idea that they need huge tax incentives or they’ll just lie and down and refuse to drill, baby, drill. President Obama proposed cutting those breaks last year – at a time when everyone on the GOP was insisting “We’re broke and we can’t afford ANYTHING,” and yet they still managed to preserve this huge boondoggle for their corporate pals. 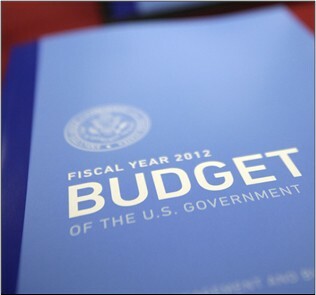 This year, President Obama is proposing cuts again: $39 billion over a decade. “Repealing fossil fuel tax preferences helps eliminate market distortions, strengthening incentives for investments in clean, renewable, and more energy efficient technologies,” the budget plan states. On the other hand, the budget does include funding for the Department of the Interior to boost oil and gas production, particularly on public lands in the west. That will be party balanced out by $450 million to preserve public lands and $28 million for new inspectors to make sure that we don’t have a repeat of the BP Gulf Oil disaster. They’ve fought money for solar and wind power, even as the Chinese government pumps up the sector at home. NO additional funding for the loan guarantee program for clean energy projects that has been under attack by the GOP since solar company Solyndra failed. “In light of the tight discretionary spending caps, this increase in funding is significant and a testament to the importance of innovation and clean energy to the country’s economic future,” the budget request says. “The choice we face as a nation is simple: do we want the clean energy technologies of tomorrow to be invented in America by American innovators, made by American workers and sold around the world, or do we want to concede those jobs to our competitors? We can and must compete for those jobs,” Energy Secretary Steven Chu added. While the EPA faces a small 2.1% decrease in its budget, that’s a far cry from GOP proposals, which range from “slash it” to “kill it completely”. Still, it seems like a strange negotiating tactic: When your opponents want to cut something, you don’t START by pre-emptively meeting them halfway. That sure hasn’t worked out in the past, and it’s probably a mistake now. Sadly, Obama’s transportation priorities are probably as dead in the water as the GOP’s. He’s once again calling for $47 billion for high-speed rail (down $6 billion from last year’s proposal), but the House and Senate will probably block that completely. He’s also calling for $50 billion in up-front infrastructure spending to boost jobs creation this year, but improving the economy is also the last thing the GOP wants to do right now. How much gets cut? Who pays? Those will be the key questions as the election heats up. Adding a Buffett Rule provision (a mimum 30% tax rate on those making more than $1 million, so that millionaires don’t pay lower tax rates than their secretaries). Don’t expect any answers for a while. Last year the budget didn’t get passed until weeks after election day. This year, expect this to drag out to the last possible minute… and then some.